Unlike the oscilloscope views which display amplitude vs time, the spectrum view reveals new detail by plotting amplitude vs frequency. 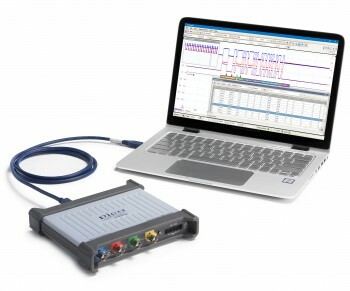 The spectrum view is ideal for finding the cause of noise or crosstalk in a signal which often looks random in the time domain. It is also often the best mode for testing distortion, frequency response and stability of amplifiers, filters and oscillators. The spectrum analyzer in PicoScope is of the Fast Fourier Transform (FFT) type which, unlike a traditional swept spectrum analyzer, has the ability to display the spectrum of a single, non-repeating waveform. PicoScope oscilloscopes have low-noise, low-distortion front-end designs and our high-resolution scopes offer exceptional levels of dynamic range (> 100 dB SFDR for the PicoScope 4262). This makes them capable of revealing signal details that other scope and dedicated analyzers miss. A full range of settings gives you control over the number of spectrum bands (FFT bins), window types, scaling (linear, log, log/log) and display modes (instantaneous, average, or peak-hold). You can display multiple spectrum views with different channel selections and zoom factors, and place these alongside oscilloscope views of the same data. A comprehensive set of automatic frequency-domain measurements can be added to the display, including THD, THD+N, SNR, SINAD and IMD. A mask limit test can be applied to a spectrum for automated tests and you can even use the AWG and spectrum mode together to perform swept scalar network analysis.